Ahead of her concerts in Australia, the Latvian accordionist charts her journey with the instrument, beginning in an attic in Russia. What made you choose the accordion? Actually it was my grandmother. I used to spend the summers in their house in Russia and one summer she found in the attic of a neighbour an accordion and she said “oh well, if it’s no use to you, let me give it to my granddaughters.” Because she could play a little bit of the Russian traditional instrument, garmoshka, from the same family as the accordion, she helped me with it and I was able to play a few songs in quite a short time. What kind of music did your grandmother play? She only played for herself and it was the traditional stuff. Nobody in my family is a musician, this is why I ended up with an accordion [laughs]. No, just the accordion. Of course, as a student I was playing the piano as well but there’s no time for everything. Why do you love the instrument so much? I think it’s one of those instruments people easily connect to because it belongs to so many traditions all over the world. It’s even popular in Bollywood, it’s a huge instrument in India, and then you get it in China, South America, it’s full of them. And of course a lot of places in Europe. I love the fact that people connect to it quite easily. 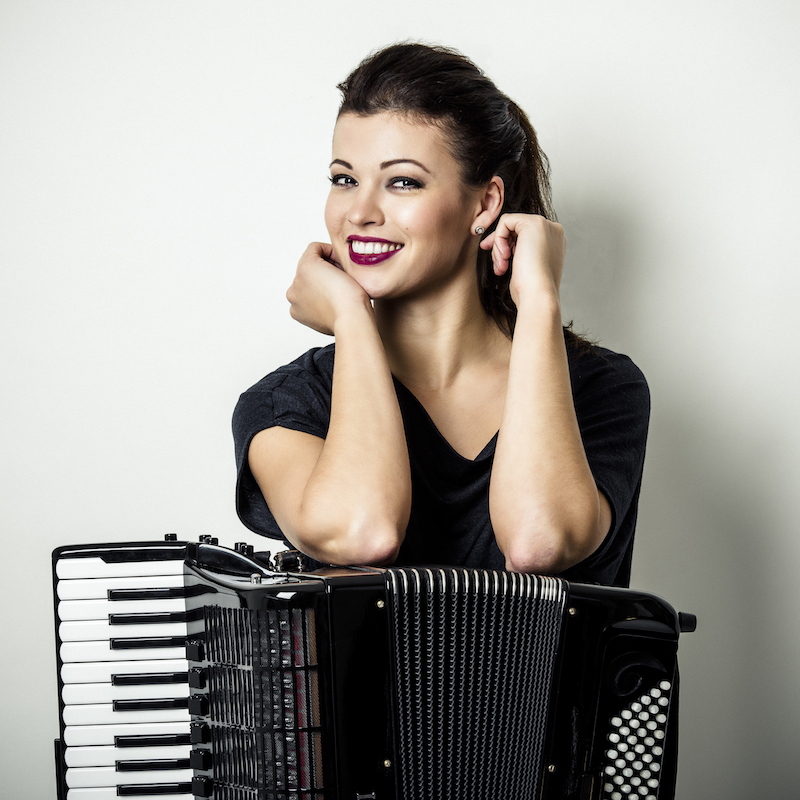 Of course they have a kind of cliché in their mind about it but classical accordionists around the world are trying to change that with the appearance of new music. So, I love the fact that it’s getting this new language and it’s so versatile. And it’s certainly portable, never mind the weight of it – three and a half stone or 21 kilos. Was playing classical accordion something you were always drawn to or did you begin with folk music? I started with folk with my grandma and later when I found a teacher back home in Latvia, it was the small classical pieces and so on. Some little ones and then later on it got more and more serious. So already by the age of 12, when I had to make a big choice about whether my parents were going to be buying quite an expensive instrument – they had to save up for it – I had the responsibility of deciding whether I really wanted to try and make a career out of it, to study further in music college. So when I came to London I already had quite a repertoire developed and that grew even more in London itself with the contemporary music. What’s the history of the instrument in terms of classical music? Its main development happened in the 60s when a manufacturer in Italy created something called a baritone bass, made for the left hand. It basically converts the keyboard from the typical accordion, you have the bass and chords, so it’s basically made for an accompaniment. Bass plus chord minor, majors, sevenths and so on. So this manufacturer created a switch which would convert the keyboard into single notes so essentially we now have two equal keyboards which makes it like two manuals and that’s why you can play polyphonic music. It became a polyphonic instrument and that was the biggest change to this instrument, so it created a lot of opportunities for composers and for performers as well to play the transcriptions. From them on, people were playing anything, even Beethoven piano concertos. While I think you can literally play pretty much anything on this instrument, I believe there is a matter of taste and it’s up to each performer. But I believe that an accordion shows best in original works and in carefully selected transcriptions. Who are the most famous classical composers that most people would have heard of who have written for the accordion? Berio, he has a Sequenza for accordion. Sofia Guibaidulina. We are about to premiere a concerto in Carnegie by Benjamin Wallfisch who is now one of the foremost composers for accordion. I’m about to premiere also in March a concerto by Claudia Montero, who is a Grammy winning composer. So you keep hearing people get interested in it here and there. It gets people’s attention because it also widens the language for a composer I believe. It has so much to offer. A lot of the repertoire you’re playing in Australia and that you’ve played elsewhere is Russian or Scandinavian. Is it the tradition that makes composers from those countries naturally think of the accordion as an instrument to write for? Partly why I chose this program is because I always like to show differences between the contemporary and original works and transcriptions. So I always like to mix in my programs, and then of course you have to make sense of why the pieces are together. So I believe that in the Russian music, yes there is a lot of melancholy and nostalgia which is close to my heart. I enjoy playing these pieces because I believe they show the accordion from an unusual side so I hope people will enjoy it. You mention taste in matters of transcription and you’re doing a few Bach transcriptions in Australia. Which other composers do you think lend themselves most tastefully to transcription? I think you can take pretty much any baroque composer and to be honest you don’t even need a lot of transcribing there. But for example I wouldn’t go for Chopin because I think the texture, the writing is really pianistic, and unsuitable for our playing. There’s a lot to change. Generally, when there are so many changes that you need to go through, I believe that the piece can lose some of the original intentions and I would only play it if it would really gain something. That’s the main question. Thinking of the great composers, who would you most wish had written an accordion concerto? Oh, Rachmaninov for example but that would have to be quite an early Rachmaninov because later on it’s too crazy pianistic for us but some of his earlier pieces lie very well on the accordion. Tchaikovsky as well. That would be great. Which composers writing today would you most like to write you a concerto? I don’t have any in mind. But if it comes up in a conversation I always like the composer also to have a wish to write for it, not that it’s just purely a commissioned work. There are some composers that express the interest first, so I can’t really tell you. And these pieces you’re premiering, have the composers written them specifically for you? Yes, and even now we’re still working on them. Even with Benjamin’s piece, even though I’m already embarking on the tour as of next Tuesday. It’s for accordion, mandolin, and chamber orchestra. We’re playing it with a friend of mine, Avi Avital, so I hope that we will keep playing it after this. I would also draw attention to my home country composer who I would actually like to have a piece from, it’s Pēteris Vasks. He’s a very well-known Latvian composer who is unfortunately very, very, very busy but we were talking once so maybe one day. A dazzling, electrifying work by Rafael Bonachela and his dancers that triggers all kinds of emotions. Rafael Bonachela uses music by Peteris Vasks and Nick Wales in his new work. Violinist Daniel Hope and the Zurich Chamber Orchestra headline a season featuring diverse offerings from at home and abroad. Accordionist Richard Galliano says the father of modern tango was “a second father” to him. What classical and experimental records are extreme enough for Finland’s extreme accordionist? Sparks fly when Finland’s “extreme” accordionist steps onstage with his squeeze-box. For those who think classical music can’t be realised on accordion with any depth or subtlety, and who couldn’t acclimatise to Richard Galliano’s accordionised Bach, this disc could be the sweetest and most eclectic means of conversion. Japanese piano accordionist Mie Miki is one of the instrument’s most gifted exponents. I doubt anyone listening to her new album of 23 virtuoso miniatures and arrangements could fail to smile at the program’s delightful eccentricities or gasp at the sheer technical mastery on display. As the title suggests, S’il vous plaît is most persuasive in French repertoire. Rigadoons by Rameau showcase Miki’s feeling for lively yet elegant Baroque ornamentation; she manages to squeeze real pathos out of Legrand’s theme from The Umbrellas of Cherbourg, and André Astier’s Miss Karting seduces with Gallic musette charm. Dance forms are the order of the day in this recital replete with waltzes (Shostakovich and Philip Glass), polkas (Rossi) and tangos (Stravinsky and the gutsy title track by Piazzolla, patron saint of accordionists). Zez Confrey’s novelty piano classic Dizzy Fingers is an inspired inclusion: one really can picture Miki’s fingers leaping and prancing over the keys and buttons. Then there’s Handel, Brahms, Schubert and Scarlatti for good measure….